We FOUND IT!!! Monica has not answered me yet, but it’s ready to mail when she does. There may be other family members who would like to have one, so I’ll leave this post as Searching for the time being. I want to praise Target for being so helpful, from the main office’s Guest Service Center to several local stores who took the time to search for the chocolate lab version to see if they had it in stock. Plus, when one was found, they held it for us until we could get there! My husband and I lost our premature firstborn a week ago. We bought him a little puppy at Target yesterday to keep him company until we’re reunited…but we’d also like to have one for ourselves. We only saw one at the store and can’t find it online anywhere. I’ve called all the Target stores in my area, but none of them have the one we’re looking for. 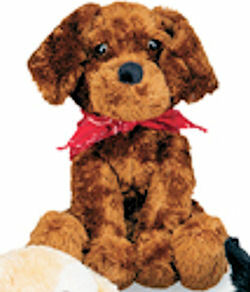 The puppy is small, all brown, with floppy ears and wearing a red bandanna. He’s a chocolate lab made of Chenille fabric. It would mean so much to us to find this puppy’s “twin” somewhere. I am so sorry for your loss. I too am looking for this dog. My daugher got it for her first birthday back in February. My cousin had gotten it at Target. I had no idea she could get so attached to something so fast. I too have been looking everyplace for a double dog as my my daughter Lily can't sleep or do anything without"doggy" I have been looking now since March. Please feel good that you picked the best gift possible to help your little angel until you see her again. Something special about this $3.99 dog. We can't help you unless you contact us! !